No wonder the euro bulls are charging! 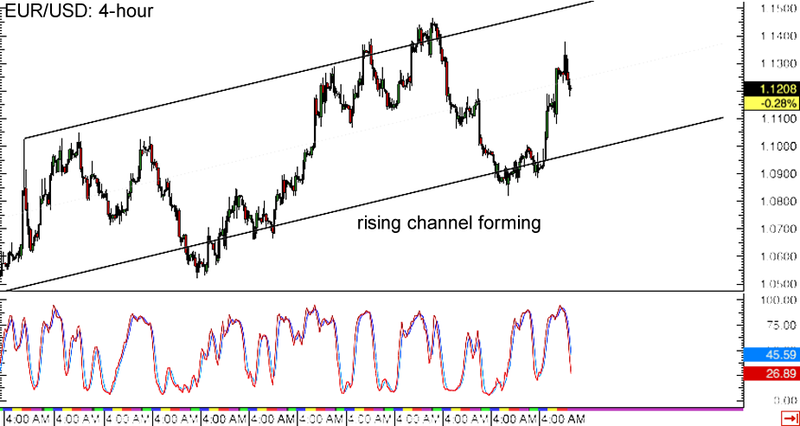 A rising channel seems to be forming on EUR/USD’s 4-hour forex chart, indicating that an uptrend is underway. At the moment, the pair is stalling around the middle of the channel, still deciding whether to carry on with its climb to the top or to pull back to the bottom of the range. Stochastic is pointing down, suggesting that another dip to the channel support near the 1.1100 major psychological level could take place. If you’re bullish on this one, you could wait for an actual test of the channel support or a break past the 1.1400 mark to catch the climb to the channel resistance just past the 1.1500 major psychological level. Careful, Aussie bulls! 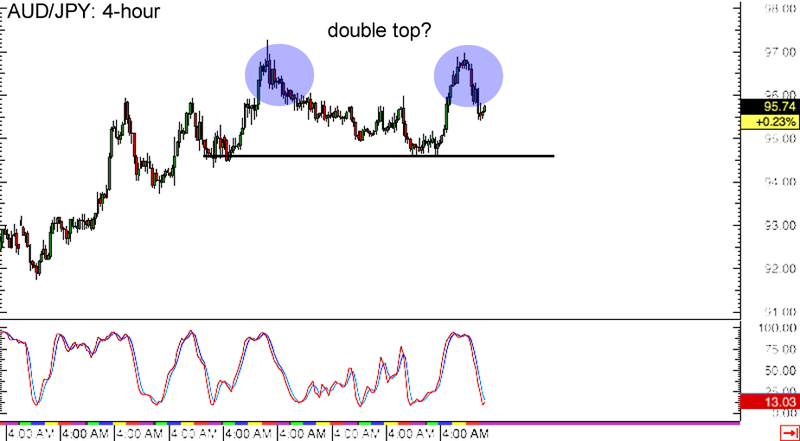 AUD/JPY could be in for a potential reversal, as a double top chart pattern is forming on its 4-hour forex chart. The pair failed in its last two attempts to break past the 97.00 major psychological level and is on its way to test the neckline around the 94.50 minor psychological mark. A break below this neckline could confirm that a longer-term selloff will take place, possibly by around 250 pips or the same height as the chart formation. Stochastic is almost in the oversold region already, hinting that buyers could put up a pretty good fight before allowing the pair to fall further. If the 94.50 level holds as support, another bounce back to the previous highs might be seen. 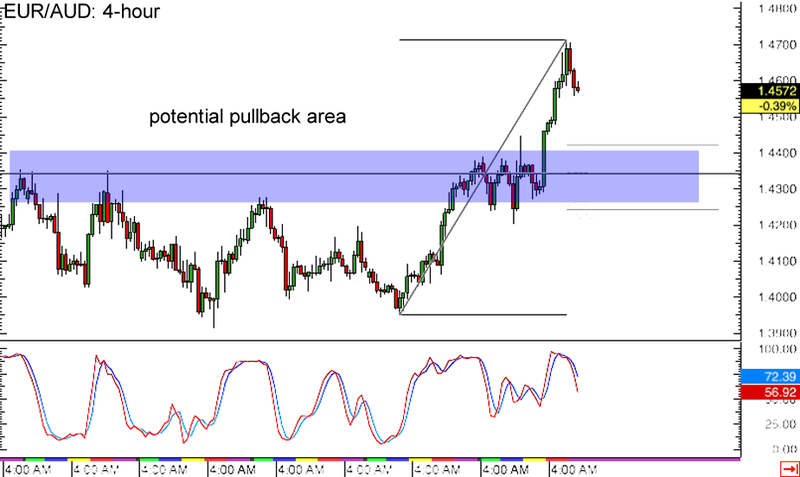 Last but certainly not least is this potential break-and-retest scenario on EUR/AUD’s 4-hour forex chart. As I’ve shown y’all yesterday, the pair broke past the range resistance at the 1.4350 minor psychological level, confirming that it’s ready for more gains. Before that happens, the pair might still be able to make a retracement to the broken resistance area, which lines up with the 50% Fibonacci level. Stochastic is starting to move down from the overbought region anyway, indicating that euro bulls need to take a break for now. A shallow retracement might last only until the 38.2% Fib, which is near the 1.4400 major psychological mark. If you’re looking to go long, make sure you set your stop below the lowest Fib!